The anime Baccano! got me in the mood to watch something that took place in 1930's America and featured a few scenes on a train. And wouldn't you know that I had something just like that in my collection? Of course, I did. 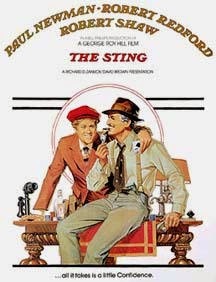 I'm talking about 1973's The Sting. George Roy Hill is probably most famous for his two outings with actors Paul Newman and Robert Redford. Naturally, I'm talking about Butch Cassidy and the Sundance Kid and The Sting. Of the two I believe that the latter is probably the less seen one these days, but both are classics worthy of high praise. Hill also directed such fine films as Slap Shot (his third and final Paul Newman outing) and The World According to Garp. Both of those will be reviewed here in time. However, let's focus on the film at hand. I had never seen it before last night. I really didn't know too much what to expect. I wasn't even sure what the title was supposed to mean. It's all about the con in this. The film follows a young con artist as he tries to get back at the man that had one of his friends killed. To do so he needs to stay one step ahead of the law and seek out the teachings of a man who has more experience with the art of the con. Paul Newman is more of a supporting player in this film. He has a few classic scenes and lines in this, but most of the attention is focused on the younger Robert Redford and the arch nemesis Robert Shaw. Redford is an actor I haven't really pursued much. This is the third film I've seen him in with the other two being Captain America: The Winter Soldier and the aforementioned Butch Cassidy and the Sundance Kid. Truthfully, I was watching this with the hopes that Newman and Shaw would have been the main characters and that Redford would have been the one in a supporting role. Paul Newman seemed like he was trying to tone it down a bit in this movie, too. This was more or less Robert Redford's time to shine and Newman seemed aware of that. This movie should have had just a bit more Newman. He wasn't even introduced until a half hour into the movie. Redford isn't a slouch, though. He carries the weight of being the main character with a sense of ease. He does have presence and there's a reason he is one of the better actors of his generation. Robert Shaw was always on point. At first I wasn't sure what character he even played. I kept trying to look for him and then I really saw his character start to come alive before my eyes. There's Robert Shaw! The talented son of a gun was hiding right before my eyes. Of course, he was the bad guy. He was always great at that. Watching this movie reminded me again that Robert Shaw died in 1978. What a tragedy. He should've had a much longer life and career than he did. The use of rags from the early 1900's in this movie was excellent. I don't know who thought of it, but whoever did was a genius. I don't really know why it worked so well, either. It just does. The Entertainer is just a fun rag and it fits the somewhat loose and slightly comedic feel of the movie. The ending is a classic. After watching so many Korean movies I fully expected the worse to happen, but I still wasn't sure if I was prepared for what might happen. It almost felt like a repeat of Butch Cassidy and the Sundance Kid. The movie could have had a sequel. Unfortunately, it did not. At least, not a good one. Robert Redford has a limited amount of characters he can play. He can be really good in the right roles but he can be wooden in the wrong roles. The Sting is a good role for him. The Candidate, Three Days..., All The President's Men, Havana and Brubaker are other favorites of mine. If you decide to watch more Redford flicks, don't expect a lot of action. He always seemed to pick interesting but kind of slow moving stories. I really liked Shaw in The Taking of Pelham One Two Three. I haven't watched the remake because I figured there was no way John Travolta could do better at that point in his career.